Destroyit 2245SC Strip Cut Paper Shredder is a sleek solution for destroying documents as well as business cards, the MBM 2245SC is a fabulous shredding machine that delivers promising results. The MBM 2245SC is a compact tool with high functionality and high performance. 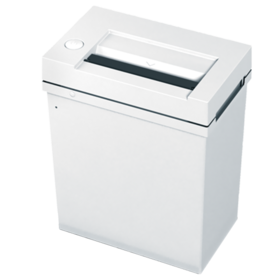 Easily capable of shredding 10-12 sheets at a time, the 2245SC is ideal for moderate shredding projects. The MBM 2245SC not only shreds paper documents but also shreds paper clips and credit cards just as smoothly facilitated by its sturdy steel cutting shafts. Giving top priority to confidentiality as well as consumer safety, the MBM 2245SC comes with a built-in transparent shield on top of the feed opening. It also ensures to always immediately shut down if and when the shredder head is removed for emptying purposes. The easy-touch multi-function switch is for stand-by, stop, reverse and delivering optical signals for the status of operations. The MBM 2245SC Paper Shredder is a high quality, high power tool that delivers promising results and ensures getting the job done efficiently.